Don't be a skaliwag, order your bulk pirate themed decorations and party favors from Party Express and save a bundle! It does not have to be Halloween to dress like a pirate. You can host a Pirate themed party any day! Ahoy Mateys! Welcome to the largest and best selection of bulk pirate party supplies and decorations. Let your inner pirate shine while wearing eye patches, plastic hooks, and skull and cross bone costume accessories. Shop Party Express for all of your pirate party needs. Decorating for a pirate theme party has never been easier! 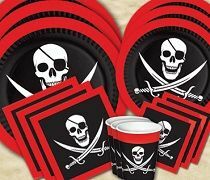 Party Express has all of the black and red matching pirate decorations to turn your event space into a real life pirate ship. You can warn all of your guests that there are pirates among us with our beware of the pirates door covers, pennant banners, party tape and banners. Hang a pirate flag decoration for all to see to let your guests know that this party is being thrown by none other than pirates. 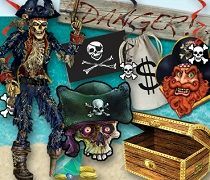 Let your guests look for the buried treasure by putting treasure box centerpieces on the tables and scattering pretend pirate coins and treasure around the party. The good news is that you have already found the treasure by finding the Party Express online store. 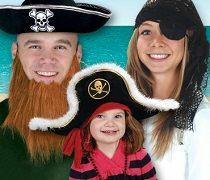 You are saving over 50% off of retail prices when you select your bulk pirate party favors from the hundreds of options that we have available. So when you are looking for buried treasure, look no further than Party Express to supply you with all of your bulk party decorations and favors.